In my article about cl_progress_indicator I've mentioned that sometimes progress showing is more time consuming than the action which is described by it, so you must be careful when using progress indicator in ABAP. I've said also that it's better to cl_progress_indicator instead of FM SAPGUI_PROGRESS_INDICATOR because of built-in function to show progress only once per 10 seconds. But sometimes when using standard SAP FM we can see that progress showing is taking too much time (like SAP_CONVERT_TO_CSV_FORMAT for example), and as we should not do any modification of the system code then we need to use a small trick to get rid of such progress indicators. Today I've got a question from Custodio de Oliveira (hope you don't mind mentioning) about Dark Eclipse settings which I'm using. As I know that settings colors in Eclipse for ADT is a pain, then I want to share with you my settings and the steps to achieve the same look like I have on my installation. Of course you can update it by your own, but at least you have a starting point. Probably this is how your Eclipse looks like, or if not then the default settings for ADT. White and eye-killing. When you're used to create buttons in ALV Grid dynamically then you think why SAP doesn't allow create dynamically buttons on GUI STATUS. You can change icon or text if you defined that function has dynamic text but you cannot create buttons at runtime and you always have to create GUI STATUS and GUI TITLE in SE41, which personally I don't like, as in most small reports you have to create usually one to five buttons. So what I want to present to you today is a way to create buttons dynamically at program runtime without a need to create GUI STATUS and GUI TITLE for each program. In fact whole trick is to create firstly a GUI STATUS in empty program which will contain only functions with dynamic texts, and then to fill properly static class attribute. So let's begin with creating our program to keep GUI STATUS and GUI TITLE. I will call it ZAB_DYNAMIC_GUI_STATUS. In the source code you do not need to put anything beside report keyword. "! Do not delete it!!! Yes, that's all from the code point of view in this program. As said it's only to keep GUI STATUS and GUI TITLE. Lets create GUI STATUS firstly and call it DYNAMIC_STATUS. Items on application toolbar will have the same naming pattern Fxx, so F01, F02 etc. Each of this function code should have dynamic function text with pattern ZCA_AB_DYNAMIC_GUI=>BUTTONS-Fxx where Fxx you have to replace by current function code. Additionally to application toolbar, fill also function keys for save, up, back, exit, print... etc so you can also use it in your programs. Many people still asks how to create field catalog for CL_GUI_ALV_GRID or REUSE_ALV_GRID_DISPLAY on a base of internal table. This is very easy since we have SALV classes, you could see it in my article Create XLSX/MHTML file from internal table in background and probably also somewhere in the net. To make it easier here are ready methods to create LVC and SLIS field catalogs from internal table using CL_SALV_CONTROLLER_METADATA and CL_SALV_TABLE. 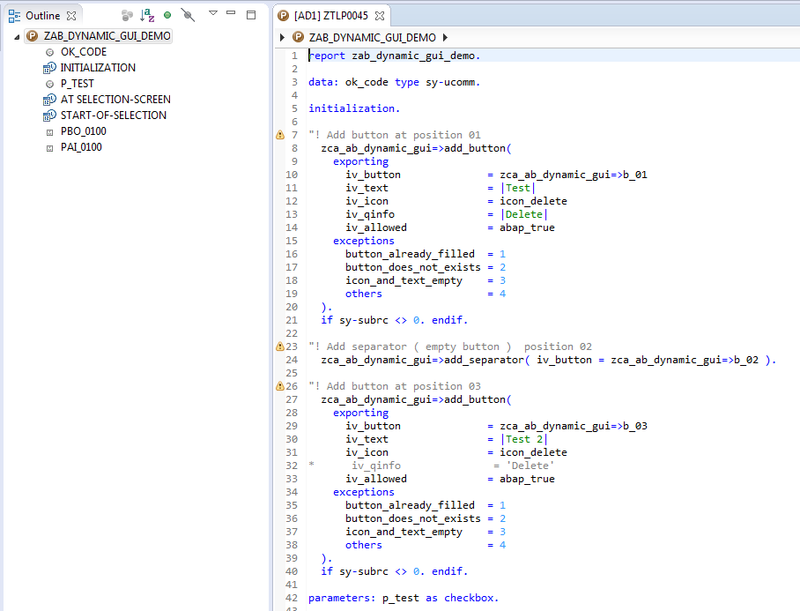 Both methods are created with new ABAP 7.40 SP05 syntax. data: table type ref to data. create data table like it_table. I know that many times showing any progress information isn't something that developer likes to have in his program, especially when it's so fast that progress indicator only slows it down horribly, but often we're putting it into code, when program runtime is quite long ( more than 1 minute) and we want to show the users that program is running and we're currently at step m of n. Since I remember I was always using SAPGUI_PROGRESS_INDICATOR FM to display such messages on the screen. When used inside loops I often was manually dividing current tabix by selected variable (for example 1000) and if there was no rest from such division then I was running this FM, just to avoid calling this FM to often. The problem of this FM is that when used in background it hasn't show any info in job log. So if you wanted to have also entries in job log, then additional lines with checks if this is foreground or background mode were needed, and if we were in bg mode then messages instead of progress indicator had to be used. I was playing a bit with CL_GUI_TIMER some time ago and I thought that this would be good to use it somewhere to have idea how it works. So I've created then a small game Battleships, which you for sure know from analog version. Game is very simple, firstly you have to build your own map with ships. Just to remind you, there are 2 submarines, 2 destroyers, 1 cruiser, 1 battleship and 1 aircraft carrier. Map is created with CL_GUI_ALV_GRID. Once you click on status button to add one of the ships, map will show you in which place you can start ship. When you'll select position of the start it will show you possible fields for end. After you build your map hit Join Game button and wait for second player to join you. If you imported NUGG file from previous article you could be surprised that there is one additional FM available called Z_AB_POPUP_GRID_MULTI_SEL. This FM can be used to call a popup with ALV grid which allows multiple row selects. constants: c_ccname_grid_popup type scrfname value 'CC_GRID_POPUP'. data: go_popup_custom_cont type ref to cl_gui_custom_container. 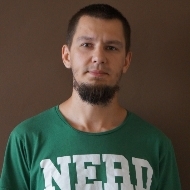 data: go_popup_grid type ref to cl_gui_alv_grid. field-symbols: <gt_popup_outtab> type standard table. When using editable ALV mass replace function is needed very often, but when it comes to creating it you have to choose which from the not so perfect possibilities you should use. You can create a screen or selection-screen with all possible fields which can be used in the function (not good when you have a lot of editable fields), you can create dynamic program and submit it (not good as then you switch to the screen of generated) or you can create a FM to call selection-screen in separate task (disadvantage is that user can click on original window and hide your popup). I've used all of these possibilities but when you'd like to reuse them then third one (FM to call dynamic selection-screen in separate task) seems the best. First of all the question is why do we need separate task to call it? Well, when you call dynamic selection-screen (with parameters like (variable) ) for the first time the output is ok, but the second time you do it in the same runtime of transaction or program then the length, type and F4 help are just like for the field generated for the firs time. This is because the generated selection screen is kept in memory an called each time with same parameters, nevertheless the change of "variable". The way to omit it is to call this selection-screen in new task. This will force SAP to regenerate selection-screen each time. When you open standard transaction you may be surprised sometimes that although you're able to attach standard attachments while creating document, you're not able to attach business document at this time. It's because business documents needs to have specified an object to which it is linked and in case of GOS for standard transactions it's always called without object id (in creation mode). When you develop own transaction and you use GOS for standard or Z object then there is a possibility to omit that restriction, as during creation of GOS manager you can assign temporary object name to it. At save (or after save) you can move attachments and business documents from temporary object to final one. The question is what will happen when you'll attach business document to temporary object but you will not save the document at the end? The document itself will be kept so you have to be sure that it will be deleted next archiving run. I will show you an example on Purchase Requisition object which is used in Z-tcode. In article Link Attachments of Purchase Requisition to Purchase Order I've shown how to link standard attachments from purchase requisition to purchase orders, but to have full set of options we also need a a method to link business documents of PR to PO. This is not so hard as we have in disposition class cl_alink_connection which allows to do such operations. Of course the time when you're copying the link depends on you, you can do it during posting of PO (as I do, to be sure that I will copy only this documents and attachments which are linked to PR's used in the PO ), you can do it after the PO is save with your some background job or you can try to insert the object directly to the GOS of purchase order. 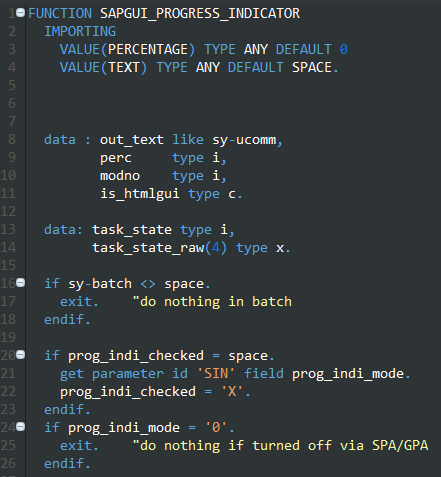 I didn't do direct attachment to GOS of PO but as I mention in the comments of Attachments article you can connect to GOS from class CL_PO_HEADER_HANDLE_MM which contains method GET_GOS_MANAGER. You can do it for example in PROCESS_ITEM method of ME_PROCESS_PO_CUST . You'll need to get header object firstly (type ref to if_purchase_order_mm ) and then call GET_GOS_MANAGER method. Anyway, I will present you the method which I used in POST method of ME_PROCESS_PO_CUST BADI. As I said, it's quite simple if you know class cl_alink_connection. Firstly we need to check if any business document is attached to PR, I will do it with method cl_alink_connection=>find. Then when we have list of all business documents we can insert link to it to PO with cl_alink_connection=>insert.